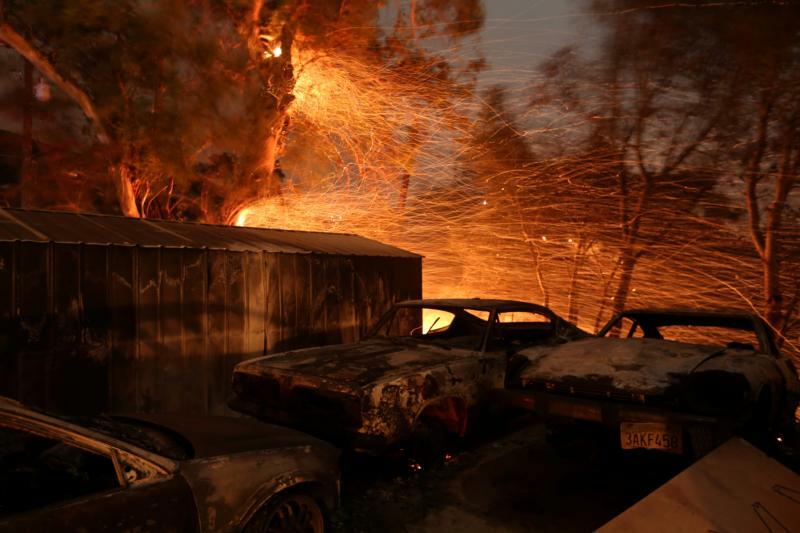 UPDATED — LOS ANGELES (CNS) — Six major wind-fueled wildfires in Southern California have destroyed more than 1,000 structures and forced the evacuation of 200,000 residents. After he surveyed the damage in Ventura County, north of Los Angeles, where the worst of the fires has raged, California Gov. Jerry Brown told reporters that the fires “may be the new normal.” He declared a state of emergency for the area Dec. 6. U.S. President Donald Trump declared a state of emergency for California Dec. 8. As of Dec. 12, officials had reported only one fatality. The Archdiocese of Los Angeles has started a fund for victims of the wildfires that have raced through the archdiocese and spread to locations in the nearby Orange and San Diego dioceses. “Friends, as the wildfires continue, the needs of our neighbors continue to increase,” said Archbishop Jose H. Gomez of Los Angeles on the archdiocesan webpage that hosts the fundraising campaign. The wildfires, which have stubbornly resisted most efforts to be reined in by firefighters, have hit Los Angeles, Ventura and Santa Barbara counties in the archdiocese. This is the second set of wildfires to have hit California this fall. Wildfires burned thousands of acres in the Sonoma and Napa areas in the northern part of the state in October, killing 31, scorching more than 128,000 acres and causing an estimated $3 billion-$6 billion in damage. The Southern California series of wildfires had passed the 150,000-acre mark within four days of their starting Dec. 4. As of the morning of Dec. 8 local time, no fatalities had been reported despite the density of population in the region. Four counties have already declared a state of emergency. Archbishop Gomez on Dec. 5 called for prayers for the well-being of families, firefighters and rescue workers “facing devastating fires and high winds” in the wildfires. On Twitter, Los Angeles Auxiliary Bishop Robert E. Barron said the fires in Ventura County, which is in his pastoral region, had alone forced 30,000 people to evacuate. Called the Thomas Fire, it is the biggest of the wildfires being stoked by dry conditions and high winds. Among the evacuees in Ventura County were students and faculty at Thomas Aquinas College in Santa Paula. The college canceled classes for the rest of the week as roads had been closed and power was out in some communities. “The college is hopeful that it will reopen in time for final exams next week,” the college said in a Dec. 5 statement. NEXT: Bishop Luong dies; he was ‘a blessing’ to Vietnamese Catholics in U.S.